But what I like about this particular combo is the unexpectedness of it. Until just a few years ago, grey was usually combined with silver tones, like chrome and nickel, even in fashion. It seems every kitchen had silver toned hardware, whether that kitchen was grey, white, or something else. But now, the contrast is so refreshing. Grey is a cool color, while the gold warms things up. I think it’s a natural reaction to the grey on grey trend where sometimes, in my opinion, it got so one dimensional that it appeared very cold. The gold tones break that up and give the space the warmth it needs. In fact, the greys are made even more gorgeous by all those gold and brass tones! This bathroom is so lovely! Via Elements of Style. One of my all-time favorite bathrooms! 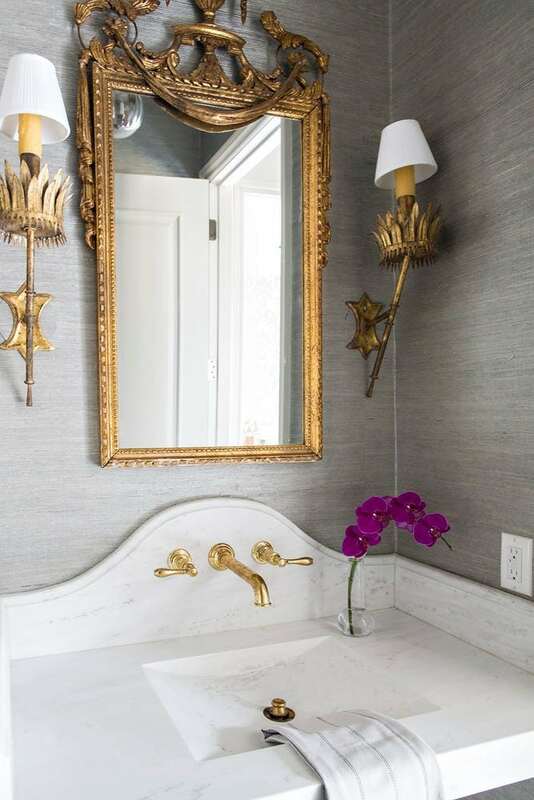 A stunning gold antique mirror against grey wallpaper. Via Dana Wolters Interiors. Design by Anna Braund via Decor Pad. 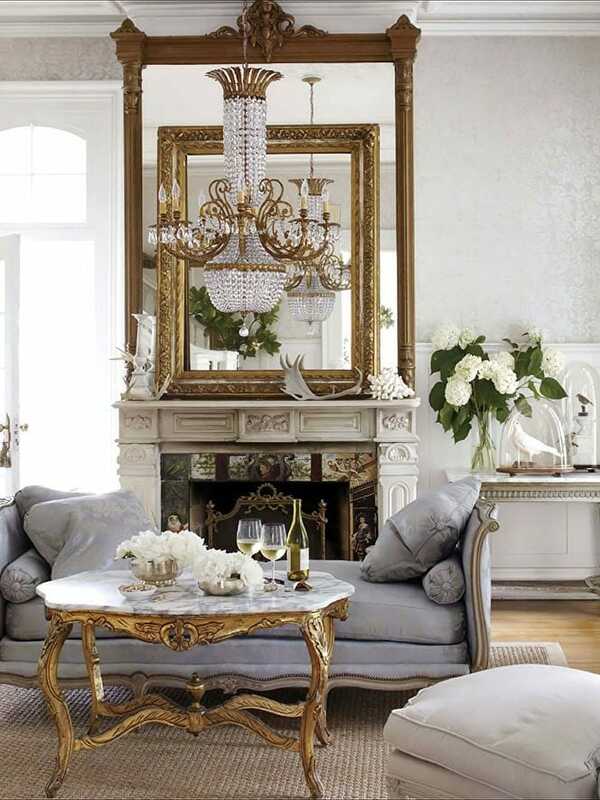 A favorite living room via House Beautiful. Such an elegant space. I love the modern fabric on the French vintage settee. Design by Melanie Turner, via Emily Followill Photography. Love this serene space! 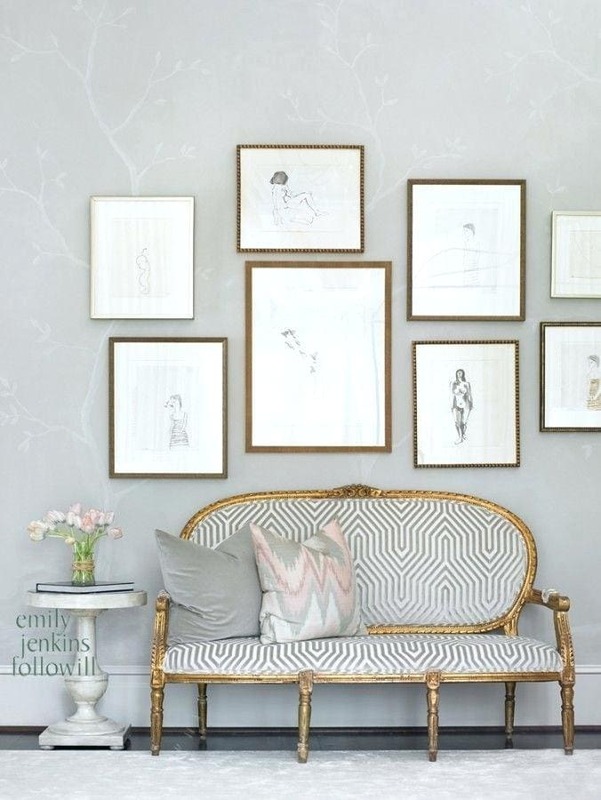 All the pale greys with just a touch of gold in the framed artwork. Design by Henhurst Interiors via New England Home. 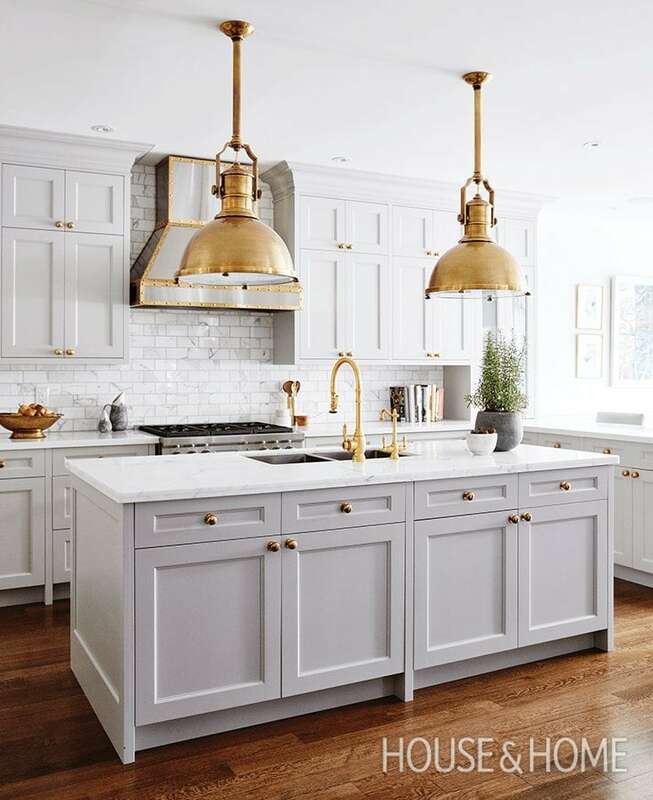 A classic grey kitchen with brass hardware – so much more interesting than if they had used chrome or nickel! Design by Heidi Piron. Love, love, love those brass pendants – they make the whole space! Design by Susan Richardson via House & Home. Design by Pencil & Paper Co via Style Me Pretty. 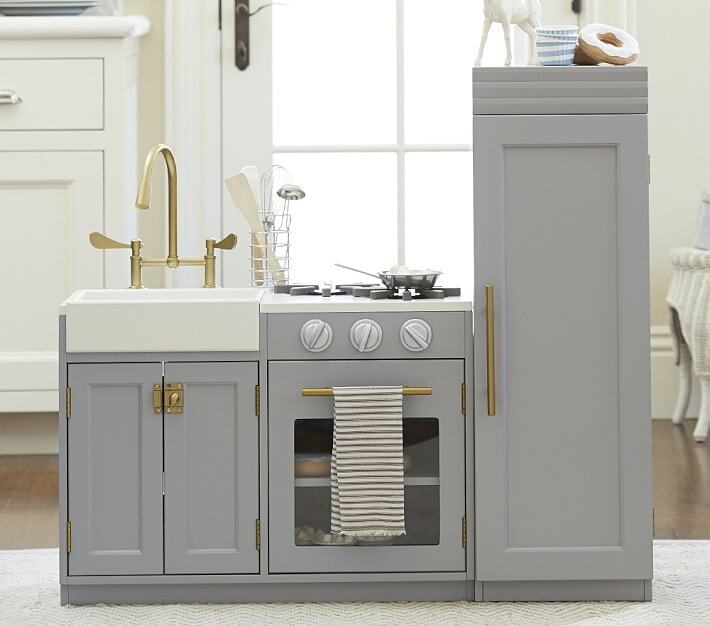 Okay, so you know it’s a trend when Pottery Barn does a “kids” kitchen in grey and gold! This cracks me up! How adorable is this?! And how about in fashion? As I mentioned earlier, previously white gold or silver accessories would have been a natural with anything grey. 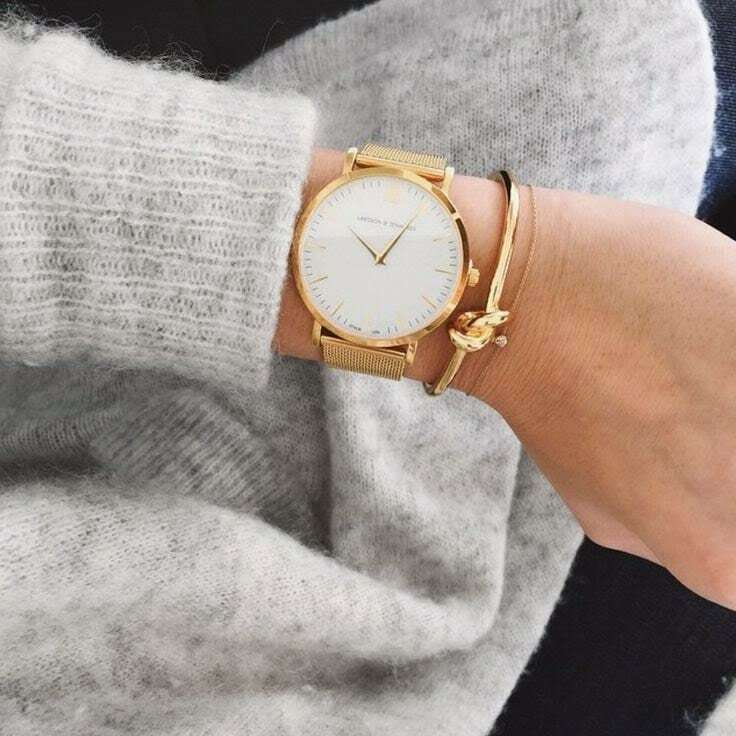 However, just like the home trend, grey outfits are being accessorized with yellow gold jewelry and watches, and it works! Again the warmth of the gold really mixes so well with the pale grey. Love! Via Larson Jennings. I’ve been using gold and grey combo for a few years now. I guess I was way ahead of the curve! So beautiful and elegant. 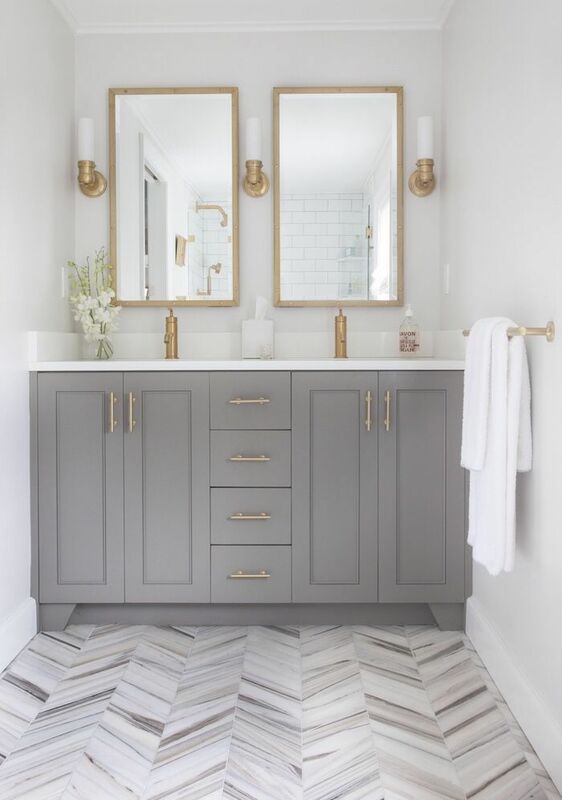 I put gold fixtures in my master bath awhile back and everyone thought I was going backwards in design but I have loved them ever since! Isn’t that so funny? I had some friends say the same thing. Anyone who did it a couple years ago (a little ahead of the curve for many!) got comments from friends and family! But it looks SO gorgeous – and it’s such a nice warmth – especially if the kitchen or bath are white. Makes me want to change mine!! Well, first of all, congratulations on building your own dream house, and secondly, kudos to you for being so cutting edge! It really is a beautiful combo and I meant what I said in the post about the brass really warming up the cool of the grey. I do think it can go with stainless appliances, for sure, but it's nice to have a couple little things that are brass in the kitchen to tie it in. Even just a little container sitting on the counter that's brass is a nice touch. If you go to my older post on brass in the kitchen (Touch of Brass – there is a link in the post above), you can see a kitchen that has stainless steel appliances and lights along with brass hardware faucets and it all works beautifully. It's the home of Sue Chiara of The Zhush blog (or pop over to her blog to take a look). Her kitchen has been featured at One King's Lane too. It's so beautiful! So excited to find your blog post! I'm building a house and we just decided on light grey cabinets with brushed gold/brass hardware. I absolutely love it! And my husband trusted my decision. But you should hear some of the reactions of my family. Like absolute horror that I was using a brass color! I keep saying people need to not think of the 80's brass – but this is a fresh new version. Now I can send along your blog article as proof 🙂 Do you find that it still goes with stainless steel appliances? Are what are some ways to coordinate the brass with other little touches in the kitchen so everything works together? I think some fixtures/hardware come in both and they are different, but for "decor" purposes I do think people use the terms interchangeably. Hope that helps! Thanks so much! And so glad you stopped by! 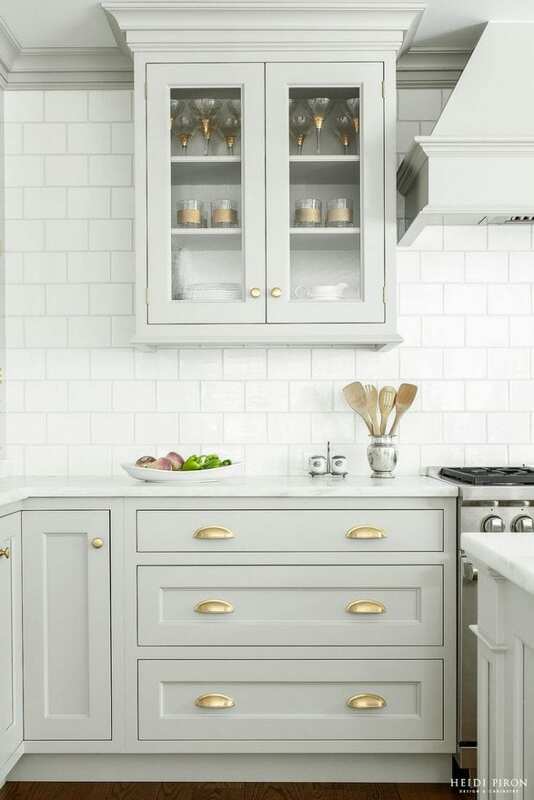 I saw a beautiful kitchen that was a white/grey (a greige) that had gold hardware instead of brass. Or at least it seemed to be more gold colored than a brass color. Do you think the gold colored hardware is the same as the brass? 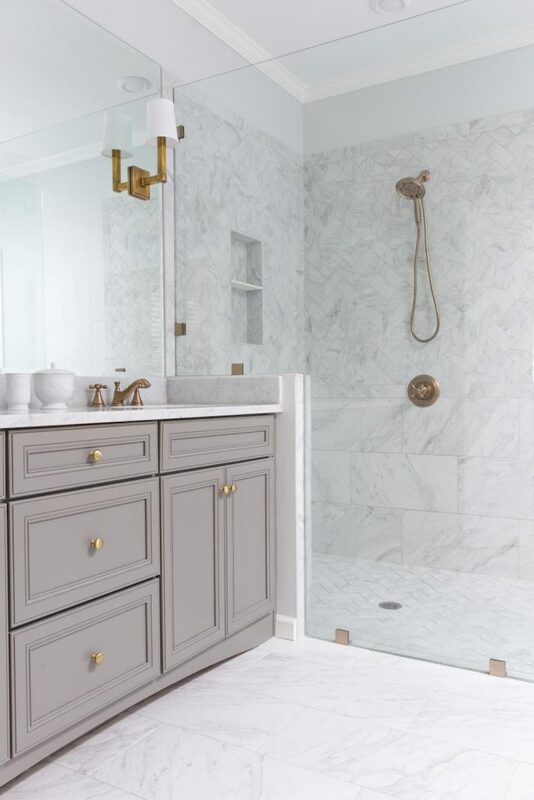 I am having a hard time trying to figure it out… Like, is gold the same as polished brass (in terms of kitchen hardware/faucet fixtures), or is it something else entirely? 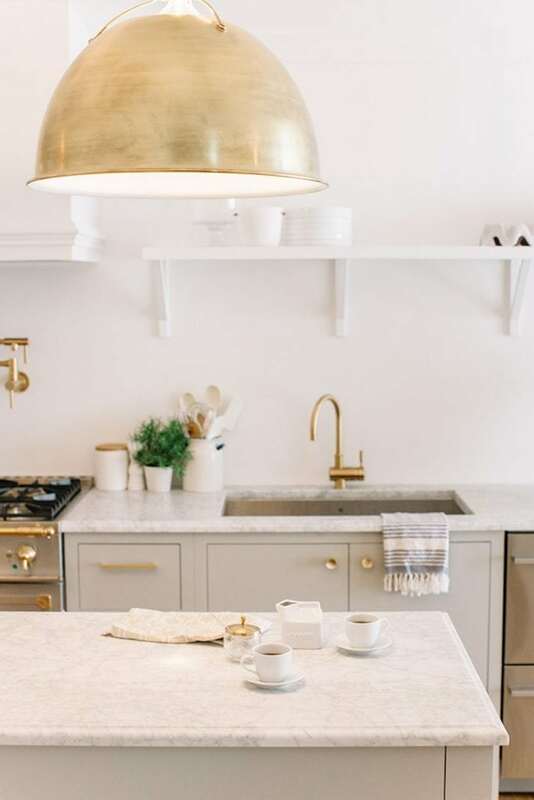 I have decided for my kitchen if my house is ever going to be built(it will, but it is soooo slow), that I am going to go with brass because you are exactly right… It adds a touch of warmth! We think alike! Happy weekend, I'm off to shopping at South Coast Plaza this weekend! Yay! What a beautiful roundup of all things grey! I think that first bathroom you featured is my fave! Thanks Des! You too dear friend! Love all these photos, Sheila! I especially love brass with the gray in the kitchens. Enjoy your weekend!